Robin Williams’ death stunned me, and if Facebook is any indication, his premature demise has got many people thinking about the ramifications of depression. I’ve admired him for years in large part because I knew what he battled. When I look back on KILMOON’s book launch, I can’t help but wonder what effect depression had on my efforts. For example, how many more copies could I have sold if I’d had the energy to organize more book signings? What to do? The best I can. That’s all I can ask of myself. So I propose that for the next book I plan to do a better job of doing the best I can without pushing myself over the edge or getting down on myself. The saddest part of all this is that I look back on the last … hmm … 15 years and imagine how many more novels I could have written by now, how much farther along I could be in my career — how many more books published! Without depression, maybe by now I’d be happily writing fiction full time. Coulda, woulda, shoulda — the bain of my existence. As an aside, I am proud of myself. Try to imagine the sheer force of will it takes to overcome the downward tendencies to THEN be able to expend yet more energy to do what needs to be done. It’s exhausting, and I did it. Do you have any advice for me, for the next book? I’ll need to be working with whatever energy level I have. Lisa, thank you so much for sharing your experience with depression now and earlier. It helps those of us who have loved ones who suffer from this terrible disease to understand more about it. I don’t think that means we can do much to help, but at least we can avoid the “cheer up!” syndrome, and can be supportive in small ways. Your decision to be kind to yourself seems like a wise one. Thank you so much, Terry. Part of the bummer of depression is that it is hard to be kind to myself — that takes conscious effort. But I’m improving! No advice, just hugs. I always appreciate your brave words on this topic. I do think that, for those who suffer from it (like me), depression is on the same coin as creativity. Not that you can’t have one without the other… but I do think your storytelling reflects your sensitivity and depth of feeling. And that’s a silver lining. Thanks, Susan! I appreciate that. Sometimes I forget that the person I am complete with the depression is the person who could write KILMOON. It is all the same coin — but … man … it’s tough. Lisa, thank you so much for your openness and sharing. It is through openness that we all come together, particularly those of us who live with depression in our lives. Unfortunately, there is a normal round of “postpartum” depression that always follows the book launch. I know, because I’ve experienced this too. It can exacerbate the existing depression, and make it feel paralyzing, as you described. The best advice I can give you is to remind yourself that some depression after a book launch is normal, and when you start beating yourself up or getting paralyzed, find some small thing that you enjoy doing. Read a book. Play with Fawn. And make yourself sit at the computer for 30 minutes every day, and write or revise. Set a timer if you need to. 30 minutes. If you feel like continuing after that, then continue. If not, then you can get up and do something else. You will find, gradually, that 30 minutes becomes 40, becomes an hour, becomes three. And if you feel alone, message me, or one of your other friends on Facebook or via text. You are not alone and we are there for you. Susan, you’re a doll. Thanks so much for your thoughtful response — I’m so glad we’ve gotten to know each other. I’ll give myself the rest of August. Starting with September, I’ll get into a new routine. September is a good month for me — the starting-the-new-school year thing. I’ve always loved that. And cooler weather — autumn too. I’ve been thinking about you this week. I really admire how much you’ve accomplished despite bouts with depression. You did do it, and you will continue to do it, and you *should* be very proud of yourself. It’s a normal writer thing to wonder “what if I’d done MORE,” so you’d be wondering that no matter what had happened, or how much or little you’d been fighting off a low spot. The Hyperbole and a Half post was amazing. For those of us who have bad days or months or get blue or sad, depression is hard to understand. That post broadened my understanding. You have been generous and kind dealing with well-meaning nincompoops, like me! Shannon! “well-meaning nincompoops” — LOL! I treasure the well-meaning people in my life. It’s the intolerant folks, who don’t even know they’re being intolerant, who get to me. Like, the kind of people who might think I’m just making excuses, being lazy, or whatever. That pisses me off. OK, off the rant now! 🙂 Cheers. Glad you ended with being proud of yourself, because at least you DID get your book out there and I am so glad you did, because I truly enjoyed it. Thinking of all those stories out there waiting to be told that will remain silent forever is most sad. Thanks for reposting the depression blog, it is spot on. So alas, I don’t have “helpful” things to say, nothing that improves on what others have said. September sounds great: something about fall and that whole fresh start of a year that carries over from all those years in school…I send you good vibes for September and kindness to yourself for August. As Lori noted, being hard on oneself is totally a “normal writer thing” (mea culpa)! Hi Alisha — thanks so much for your kind response. Living with someone who has depression has got to be extremely difficult because you so want to help the other person. Plus, it can just be a downer to be around someone who is down! I can’t wait for September! Good kind vibes to you too! Thanks for *this* response, too–it meant a lot to me to just put that out there on Friday, especially as I find myself thinking “I don’t want to whine…” 🙂 Perspective is always good. Lisa, thank you for being open about depression and sharing this with us. The hyperbole article really helped to give us clues to what depression looks like. One thing that hit me was the article mentioned 19 months of depression! I read somewhere that if someone is feeling sad for more than two weeks, then it is depression. I do not have any advice per se. All I can think is “give yourself a break.” It sounds from your previous rely to someone that you are doing that. From the hyperbole article, it sounds like depression is similar to feeling overwhelmed. 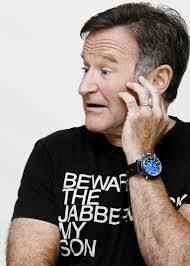 I just read this morning that Robin Williams was in early stages of Parkinson’s disease. And I read this insightful column by a regular columnist in the SF Chronicle this week. He mentioned that he could not remember anything good that happened. While reading his article., I was reminded of this TV commercial, which was designed to SELL you anti-depression medication. This medicine was supposed to help you put an handle on depression. There was a scene with a depressed person and a cute dog waiting with a leash and a ball, as if the dog wanted to play but the dog had a sad expression on its face while looking at the depressed person looking out the window. On another note, I finally found a copy of KILMOON! It was at one of my favorite bookstores. They have a wide selection of mysteries. Yay! I am reading it. Thank you for sharing the hyperbole article. I found the news of Williams’ Parkinson’s elucidating too. Maybe it just became too much for him to bear — having battled depression/addiction his whole adult life and then to face Parkinson’s? Wow. I find the columnist’s statement interesting. And almost a relief too. Because I have a hard time remembering good things too. I have to think about it harder than negative memories. Never realized that this might be kind of normal for people with depression! Lisa, I empathize with you. I’ve suffered from panic disorder for more than 30 years, which also makes you depressed. If it wasn’t for my dogs and my husband I don’t know where I would be. On the other hand, it started me painting…When you think of all the incredible writers, painters, composers and other artists, most of them were depressed or had other mental demons. Munch’s The Scream depicts him having a panic attack and supposedly he painted many, many versions. Maybe if you didn’t have depression, you wouldn’t have written and published Kilmoon! Drifting through life in a happy, go lucky state…Actually, if there is such a thing as reincarnation, I want to come back as happy, go lucky! Thank goodness the stigma is lessening – I found that pretending to be normal became oppressive and now that I’ve ‘outed’ myself, life is easier. Thanks, Hannelore! It’s so true about outing ourselves. Makes our lives so much easier — and I’ve found that my true friends take me as I am. I like that they don’t pressure to go out more, do more, come on, come on, if I’m in the dumps. I read the link you provided. When I got to the kernel of corn I laughed, them I cried. I haven’t been quite that far down the road, but almost. At least I had anger, sorta. Hi Eve! The kernel of corn — yeah, it’s hilarious at the same time a big bummer. I’ve never really had the hysterics like that either, but I’ve been close. I just spent an afternoon with a friend of mine. She’s a fantastic artist, but so far she hasn’t achieved either tremendous success or (her real plan) a tenure-track teaching position. And she’s in her thirties now, seeing some of her peers achieving much more (and in some cases, as she says, with work that isn’t as good as hers). What can she do? She does what she does — doing her work and teaching where she can. It’s working out pretty well, actually, other than the pull to compare herself to this one and that one, which she’s trying to avoid. I was somewhat inoculated against this by my mother, who was an art historian. There are always those who achieve great success at a young age, and those who never achieve professional success at all but are recognized after they’re gone. All you can do is do the best work you can. Depression, as I know from experience, makes that much more difficult than it is already, in this world obsessed with celebrity and commercial success. Hi Anthony — it’s so hard not to compare ourselves to others sometimes, isn’t it? It’s so self-defeating, yet sometimes I can’t help myself. When I’m in a low place, I look at other writers, thinking to myself: why can’t I be like that? I have the simplest goal: to have consistent energy month to month … Ah well. Congratulations on getting your paragraph in during a grieving process. It’s hard, I so know. My condolences. That’s a huge thing, Anthony! Hey, when you write serial fiction for the Web, it’s good to find those problems sooner rather than later (preferably before pressing “Post” 🙂 ).